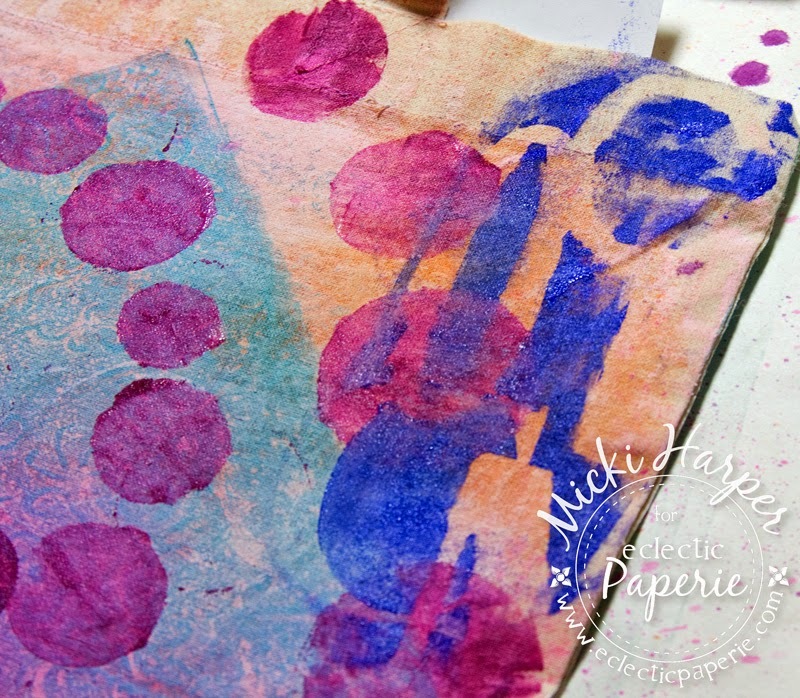 Hi gang, Micki here to share my project for this months' ePlay Challenge hosted by our Andiepants. 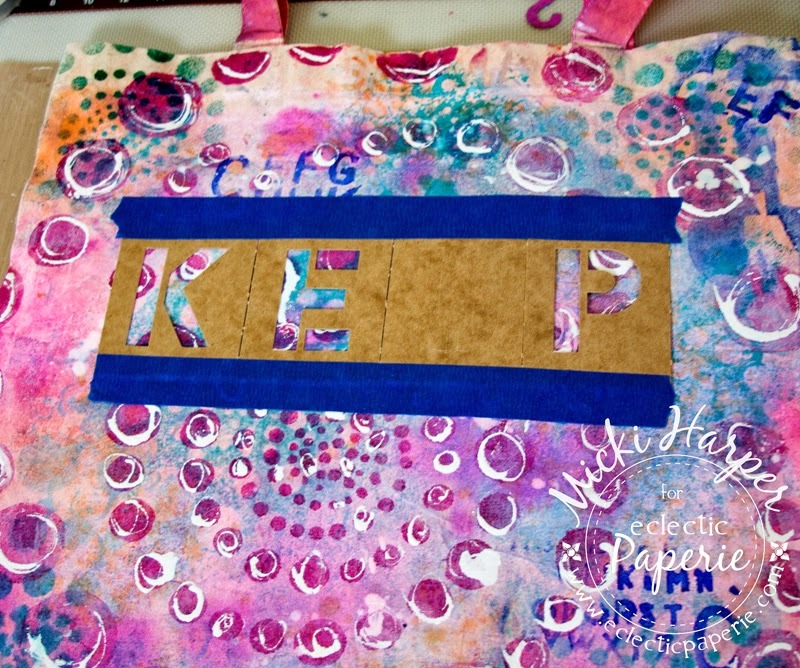 Andie's challenge to use fabric was the push I needed to finish the back of my canvas tote bag. The front of the bag was created for eP's February challenge, which called for creating a project using a bag. I wasn't sure what I wanted the other side of the tote to be. Do I attempt to sketch a back view of a person to go with the front? The thought had me a little worried so in the end I decided to go with a simple - but very meaningful - statement I had found on Pinterest. I'll share a side by side view of both the front and back sides of the tote at the end of the post. 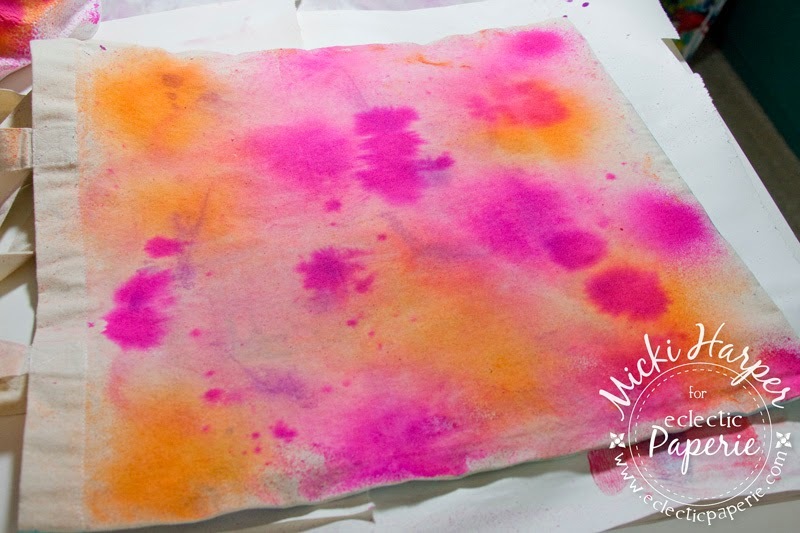 I continued to spritz water over the canvas to help the colors spread and to help lighten them up a little. After the inks had dried, I decided that the colors were still a little too strong. I wanted to keep the overall intensitiy of the colors similiar to the front of the tote. So gesso was added with a dry brush, followed by taking a brayer and pressing hard(er than normal) to distribute the white gesso. 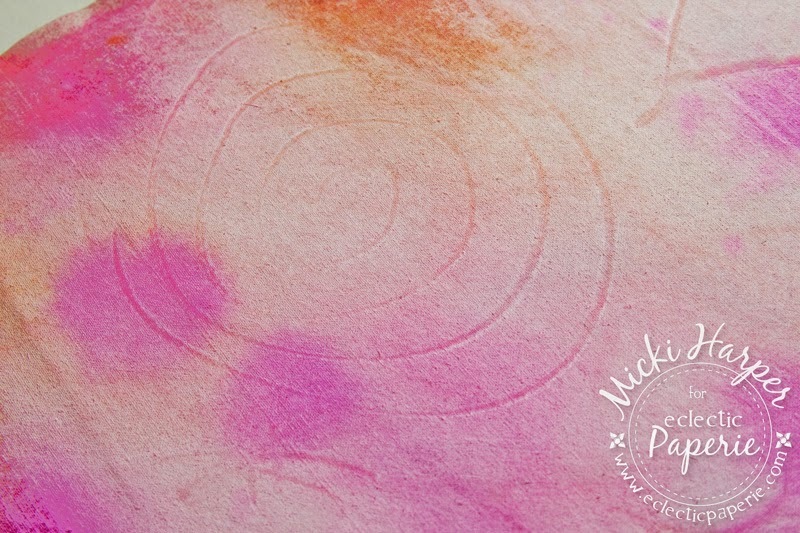 While the gesso was still wet, I used the back of the brush to add some scribbles and marks. 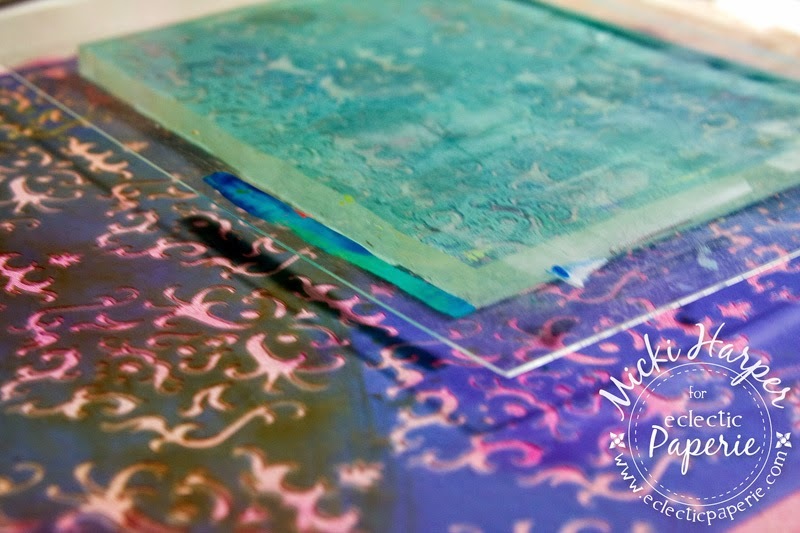 Next I grabbed Dina Wakley's Paints, my Gelli Plate and Prima's Art Stencil - Donna Downey's Damask. 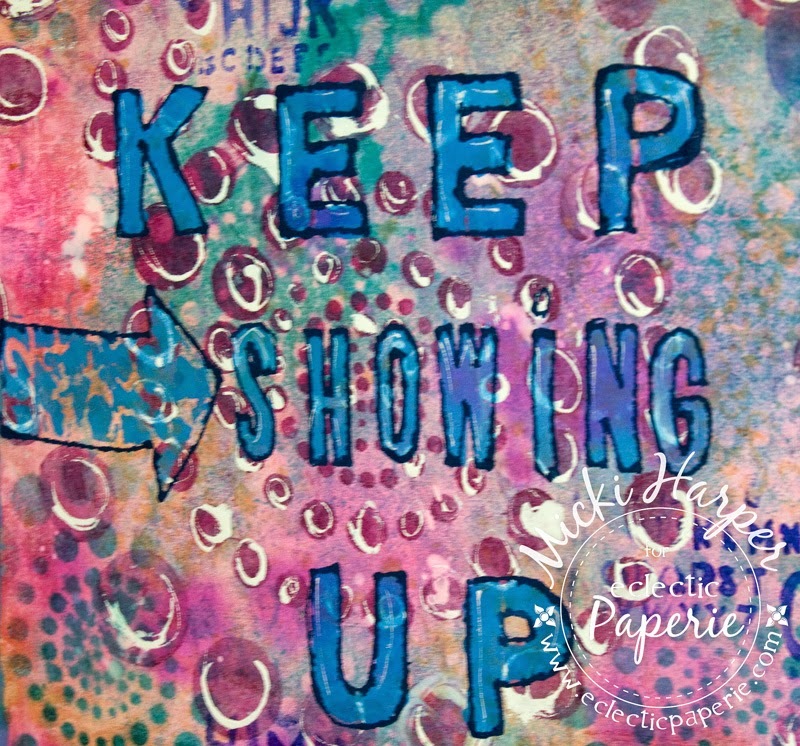 I could have used paint or sprays over the stencil instead of the Gelli Plate, but the results is a bit more subtle and you get three different result; the first print, then the 2nd print off the Gelli Plate and finally, the residue of paint on the stencil. 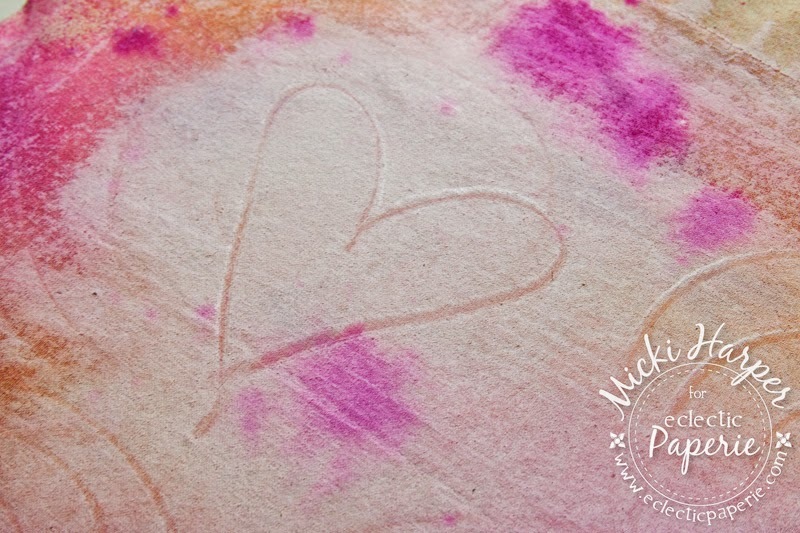 On the rest of the stencils used, I used paint and Ranger's Cut 'n Dry Foam Pads. 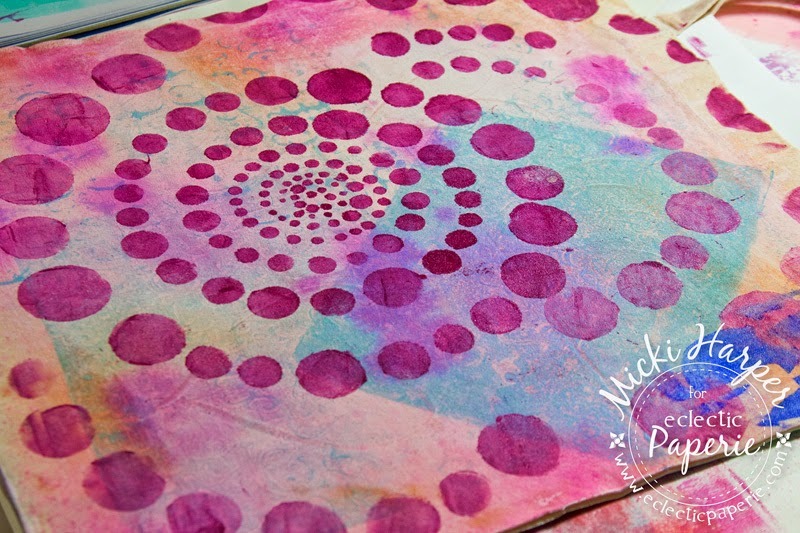 To make the seemingly continuous circular dots, I just keept moving the Prima's Elementals - Spirals to continue another row of dots. 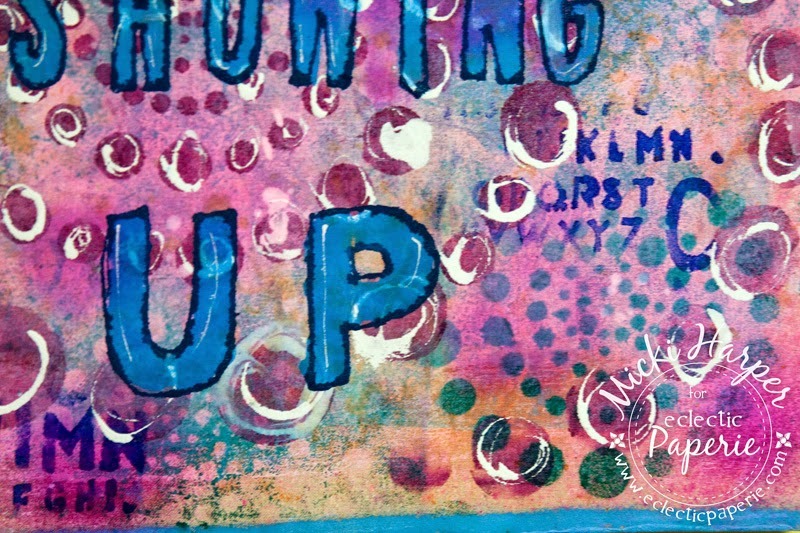 I also added the Numbers Collage stencil thinking to create a border, but decided I didn't like the darker blue. 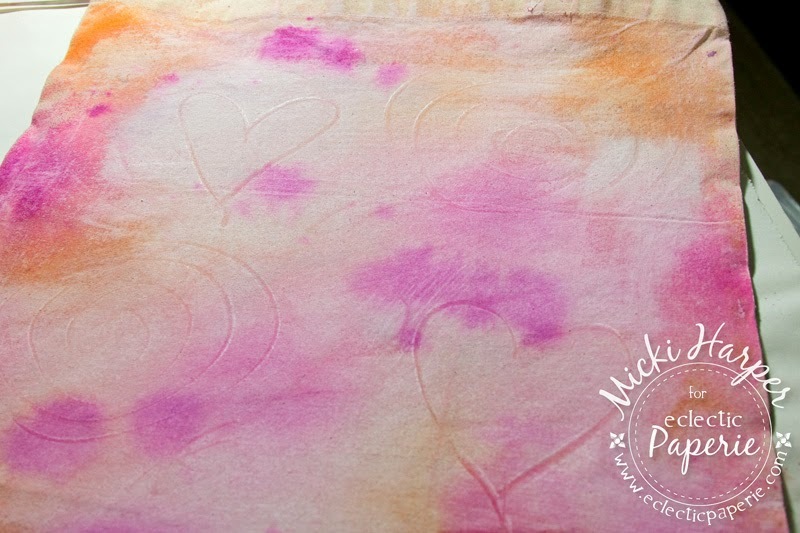 Using an old rag, I blotted as much of the still wet paint off and then just used a wet brush to blend any remaining paint into the canvas. Using the center of the Prima's Elementals - Sprials stencil, I randomly added the center part of the stencil using Dylusions Polished Jade Ink Spray. Since there was only one "E" stencil, I used another letter to make sure I got the width correct, because as you will see, I'm horrible at gauging distance as far as stamping goes. 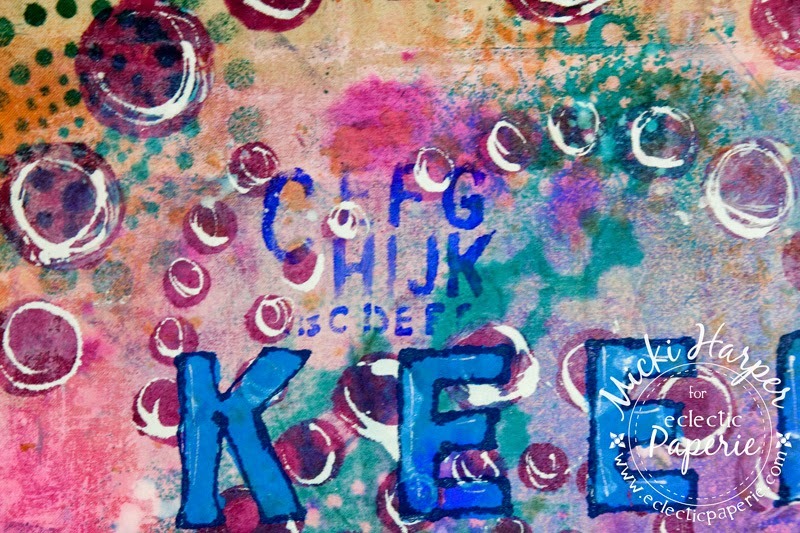 The word "SHOWING" was stamped using some old alphabet stamps. The paint was dabbed right onto the stamps and because I stamped off-kilter, I used TCW's Numbers in Arrow stencil to off set that mishap. I mixed a little paint (Lapis with Night) with water and again, used the pipette to outline the letters and arrow. This time I added a lot more water to make the paint really fluid. The whole tote received several coats of fixative as well as Gloss Glue 'n Seal. 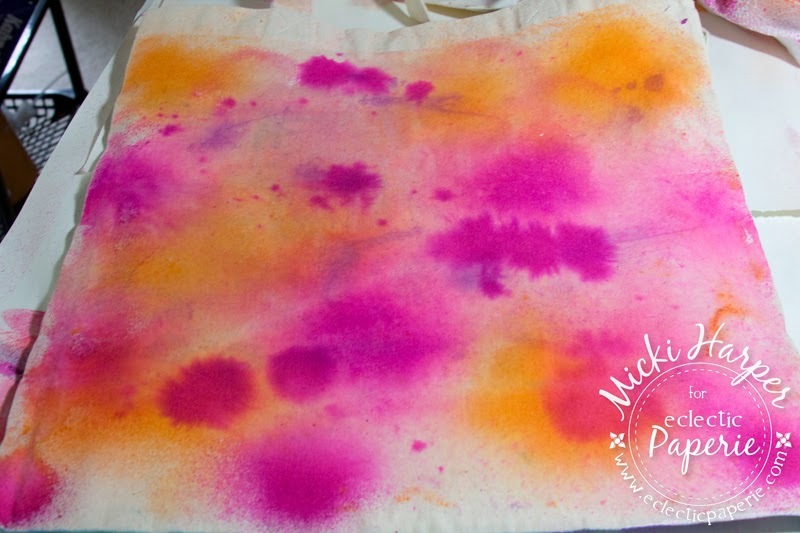 Because I have such a tendency to get out all my paints and "play" with mixing colors, I knew I wouldn't get the back of the tote to match the colors exactly as on the front, but the overall color theme is there! In hind sight, I should have used all of the same stencils as on the front but I really didn't want to replicate the exact same background. 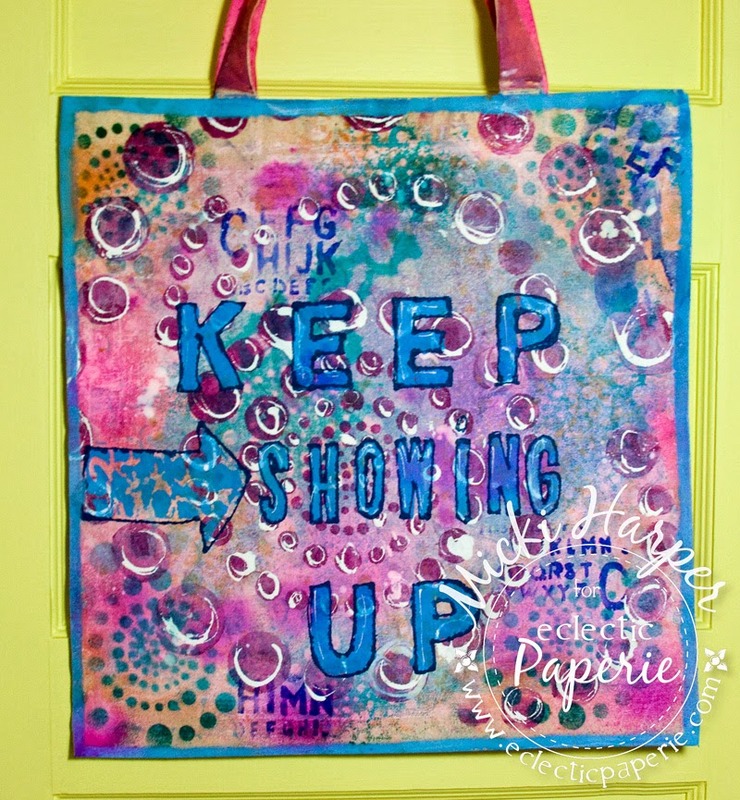 Besides, I feel great that I've finished this cool canvas tote, which I will most definitely be using to tote my lunch time art supplies to work and for those moments I need some positive "hang in there girl" vibes! 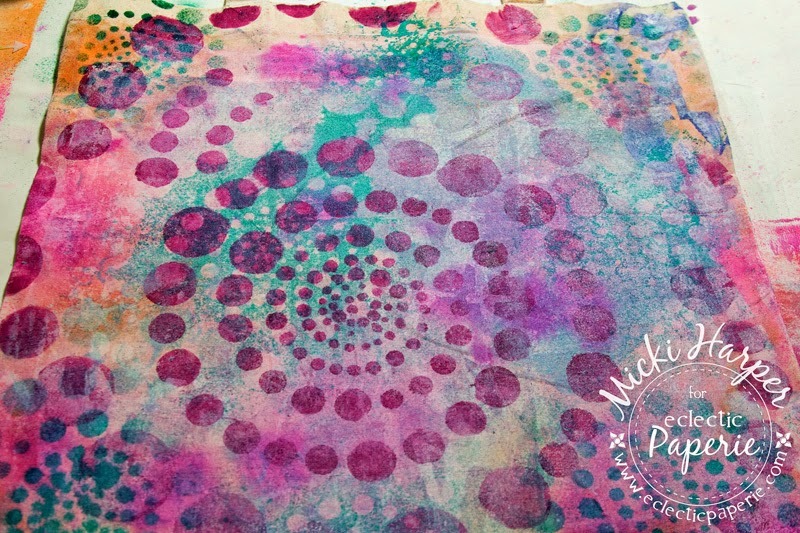 Sure hope you join us in this months ePlay Challenge to play with FABRIC. 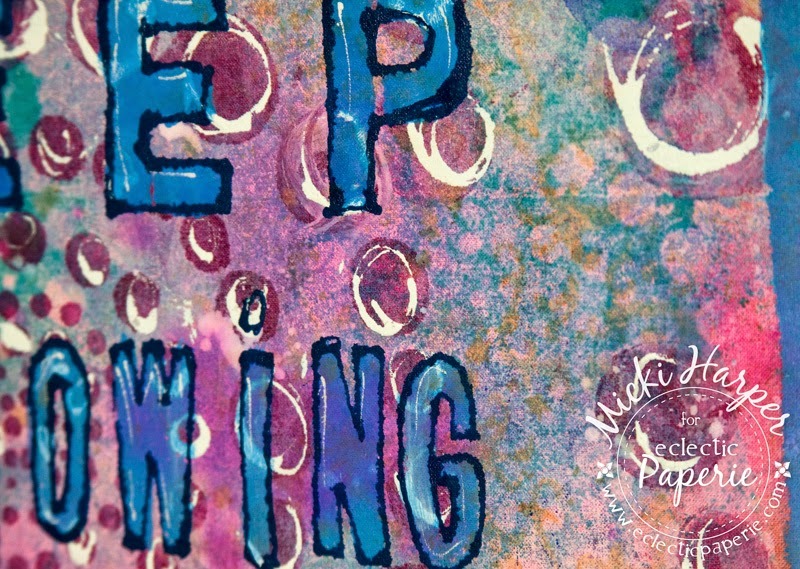 It's fun and really not that much different than painting on canvas or paper, especially if using ink sprays and stencils. Except drying time, which can be frustrating for those of us who have no patience, lo. I hope you were inspired! 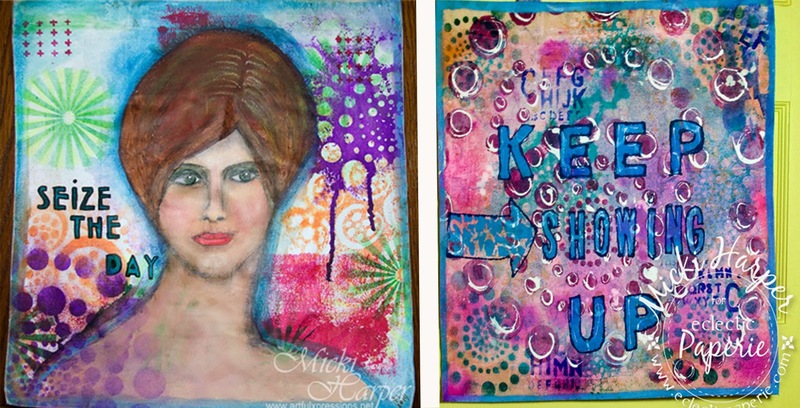 Now go check out all the fabulous inspiration for this fun challenge!!!!! LOVE both sides of your FAB bag. If I were carrying it, I would keep flipping it around so people could see how Beautiful BOTH sides are, Micki! Wow Micki! 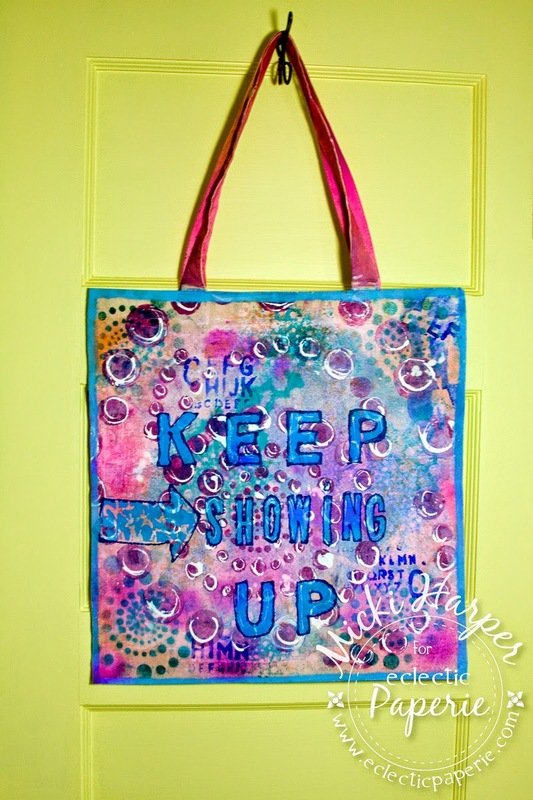 what a bright and delightful bag you created - a perfect ying to the front yang! That sentiment is wonderful! Wow Micki, your bag is gorgeous ! I love this! Great colors and sentiment. You inspire me each time you create!